Finding it difficult to save for retirement? You can save big without earning more or changing your spending habits. The key is low interest rates -- that's what makes home equity the best lending vehicle ever. That's a savings of $724 each month! With this scenario, you've put $25,000 into your RSP and reduced your total monthly payment by $724; a great improvement in cash flow! Today's low mortgage rates are a fantastic vehicle for saving. 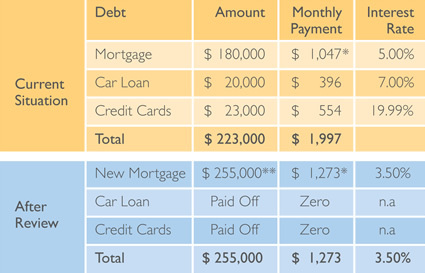 Not only do they make mortgage payments smaller; they're also a great vehicle for eliminating high-interest debt and saving for retirement -- all in one! Let us assess your situation and help you decide if a new mortgage is right for you. With over 50 lender partners, including most of the major banks, we can find the best mortgage to fit your specific situation. We can even show you how to leverage savings for your retirement and reduce your taxes -- all in one! Take advantage of this golden opportunity and start saving for your retirement now!